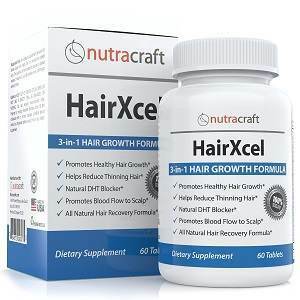 This is a review of the product HairXcel by Nutracraft. The manufacturer of this product claims that it has been formulated with the help of vital ingredients that can provide complete nourishment to the hair from the inside out. In addition to this, the manufacturer also claims that this product can provide better support to the hair follicles and also restore the health of your damaged follicles. As a result there will be an improvement in the shine and appearance of your hair and you’ll notice your hair getting thicker, longer, and stronger. Read on to learn more about the ingredients of this product as well as our opinion of whether it is the right product to take for the growth of your hair. It is recommended that adults take two tablets of this product daily, preferably with food and water. There are no serious side effects of this product as it is made up of natural ingredients like vitamins and minerals. However, pregnant and lactating women should only use this product after consulting with their doctor. In case of an allergic reaction to any of the ingredient in the product, you should contact a doctor immediately. The original price of one bottle of this product was $49.99 but it is now available on Amazon at a price of $35.95 and includes free shipping. One bottle of this product contains 60 tablets which are enough to last a full month. The manufacturer of this product does offer a strong hundred percent risk-free money back guarantee and states that if you are not satisfied with the product and if it doesn’t show the desired results then you can return it within 60 days of purchase and you will be provided a full refund. There are a lot of reviews of this product on Amazon which are all positive. HairXcel by NutraCraft is a dietary supplement which can increase the circulation of blood to the scalp and deliver nutrients to the scalp which can assist with the growth of hair. It can provide nutrients like silica, biotin and other vitamins to your body and provide nourishment from the inside. It also contains saw palmetto and pygeum africanum which can block the production of a hormone known as DHT which is the prime cause of hair loss in both men and women. However, this product is a little expensive and the manufacturer doesn’t offer any kind of discount on purchasing more than one bottle of this product. John Brownstone	reviewed Nutracraft HairXcel	on July 29th	 and gave it a rating of 4.